"Here is a musical streams-of-story, an appealing history of 'marketing trends and stylistic patterns in the development of pop/rock music.' Topping the chart is a time-series of popular and rock music as a share of total record sales, although the names are not scaled in proportion to their contributions to the grand total. Bold letters indicate some of the 24 stylistic categories, fountains flowing into musical streams, (eg Schlock Rock, lower left). Several fashions, including Bubblegum and Surf, did not last, to the relief of a grateful world. In these overlapping parallel time-series, a few names of the 470 artists are repeated, as they resurface in fresh currents. The multiple parallel flows locate music-makers in two dimensions - linking musical parents and offspring from 1955 to 1974, and listing contemporaries for each year. 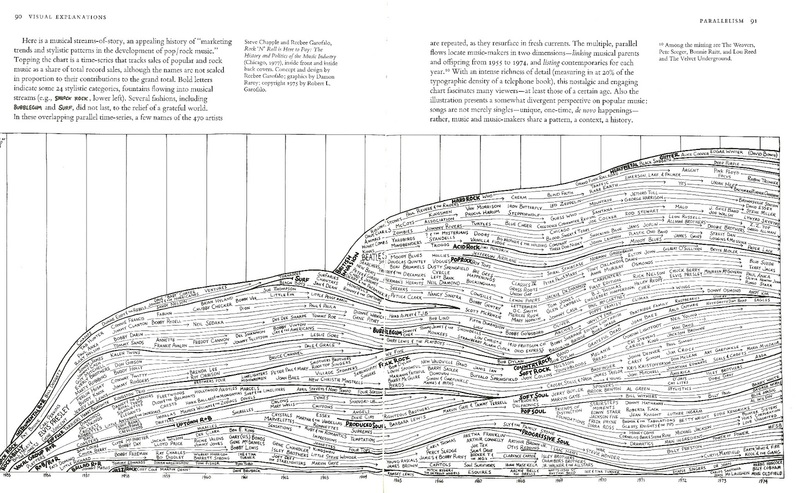 With an intense richness of detail (measuring in at 20% of the typographic density of a telephone book), this nostalgic and engaging chart fascinates many viewers - at least those of a certain age. Also the illustration presents a somewhat divergent perspective on popular music: songs are not merely singles - unique, one-time, de novo happenings - rather music and music-makers share a pattern, a context, a history. Library find of the day: Chart of musical groups and movements from 1955 to 1974, discovered in an Interloan book 'Visual Explanations: images and quantities, evidence and narrative', Edward R. Tufte, 1997. A fascinating chart, which I have also printed out to put up on my walls, and hopefully will work as a blueprint by which to discover more bands. And I could even do that chronologically.